If taking photos is your sole aim or you're OCD about pixels, look elsewhere. But if getting a top smartphone at a reasonable price - and with battery life that puts others to shame - is your goal, then we heartily recommend the Motorola Razr i. Eight years ago, when the Android 4.0, Intel inside-toting Razr i wasn't even a glint in Motorola's eye, something revolutionary happened in phone land. Motorola launched the Razr line. This was a time when Nokia ruled the phone world; an age where Ericsson and Motorola were the other big boys, Samsung was a bit of an also-ran trying to compete but struggling, and Apple... well, it had not long launched the iPod, which "put 1,000 songs in your pocket." Indeed, Apple teamed up with Motorola to launch the first iTunes enabled phone, the ROKR (which was a dismal failure) before deciding that it could do the whole thing better itself. Apple's iPhone line has now arguably become the most successful of all time - five million iPhone 5 handsets sold in the first three days. Which puts Motorola's 130m Razrs in four years into perspective. Motorola's Razr line never really died. It just fell into a coma, with the occasional slumber of consciousness across various iterations. And now, under the ownership (although, perhaps not the hands-on stewardship) of parent company Google, the Razr is being given another more high profile outing. With the above in mind, it's ironic that when we opened the box and pulled the Motorola Razr i out, the first thing we thought was "wow - it looks like an iPhone 5". We know that will have some diehard Apple fanboys clutching their pearls - and we'll probably go to iHell for saying it - but hold the Motorola Razr i in your mitts and you'll see what we mean. Firstly, the size. At 122.5 x 60.9 x 8.3mm (4.8 x 2.4 x 0.3 inches), it's about the same width and height, albeit a little fatter and slightly heavier, than the iPhone 5. It also feels similar - the mixture of Kevlar and glass instead of aluminum and glass gives it that premium feel, and Motorola has gone down the same industrialised route as Apple. Yes, the lines are not as precise - there's the odd bit of metal thrown in there on the front and there are lots of screws (six! Yes, six screws on show ,with no attempt to hide them) plus various buttons. It's not as 'clean' or minimalist as an iPhone, but we can definitely see what Motorola is trying to do here. Clearly, it wants the Motorola Razr i to look tough, yet chic; to take that "I'm the man" but also "I'm beautiful" approach in the same way an iPhone does. Like a warehouse conversion apartment in a scruffy part of London, inhabited by somebody elegant and wealthy. It's a perfect mix and blend of two worlds that works together. Up top, there's not much to report apart from a headphone jack, while the right-hand side has two metal buttons (power/standby and camera). The Motorola Razr i tapers off around the bottom, while the left-hand side holds the micro USB sync/charging port and a little plastic flap that enables you to slot in your SIM and microSD card, so you can expand the 8GB of provided storage by another 64GB. And those screws... Those damn screws that we've looked at over and over again, unable to decide if they look cool or terrible. A brief mention of the SIM tray - and we would recommend removing children from the area when inserting it, since this phone will make you utter many profanities. The simplest of tasks - inserting a micro SIM into a Motorola Razr i - was, unfortunately, one of the most laborious things we've ever done. In fact, we'd go so far as to say it is hideous. There's no spring, no real guidance there, and we spent 45 minutes trying to do it. The tweezers were out at one point. We'll never get those minutes back. Awful. Around the back, you've got that Kevlar coating just beneath the 8MP rear camera, which is accompanied by a flash. The big selling point for Motorola is the screen. It's an edge to edge display, meaning there is no wasted space at the side taken up by an annoying bezel. Apart from an annoying black bar at the bottom of the screen that eats into the display. It's obviously there for a reason, but it takes the gloss off the experience ever so slightly. Nevertheless, this is a pretty great display. It's smaller than many these days, at 4.3 inches across, and with a 540 x 960 pixel display (256ppi density). Being a Super AMOLED panel, blacks are very black and colours are incredibly vivid. Whites can appear a little bit yellow, which we noticed on websites and in the Gmail app, but it's nothing too severe. In fact, our only complaint with the screen is that pixel density. It shows just how much we've changed that we now think that's a little 'third world', but it just can't match something like the iPhone's Retina display or similar panels on the Samsung Galaxy S3 or HTC One X. It's not bad - and regular users probably won't even notice. But spotting pixels has become a bit of a pastime for many of us as technology has moved on, and you can definitely see them when you zoom into text, which is a shame, because it's the only fly in a perfectly concocted ointment. And of course, the other selling point is the chip inside. This is one of the first Intel Inside phones to hit the UK - and the first Motorola branded one - with a single-core 2GHz brain inside. Add to that the 1GB RAM and Android 4.0 Ice Cream Sandwich (which is now being beefed up to Android Jelly Bean as we speak) and this is a seriously impressive handset, on paper at least. Price-wise, the Motorola Razr i is fairly reasonable. The European phone is being marketed at the higher end of mid-range and so, to pick one up SIM free in the UK, you'll need to fork out just under £400 (about AU$620, US$648). You can get it free on two year contracts for £23-£31 (around AU$36-48, US37-$50) per month, which is actually quite reasonable, even though we think 24-month terms are the devil's work. 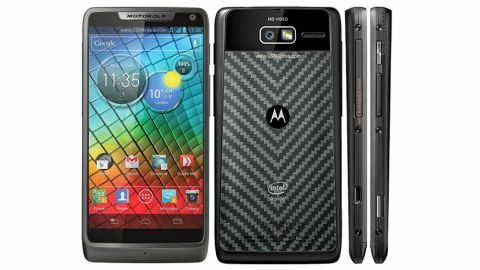 The Motorola Razr i is being pitched right alongside the likes of the Sony Xperia S and the HTC One S - both very capable handsets. However, they've been out for a while longer - and that may just be enough to edge the Motorola Razr i forward in your affections.